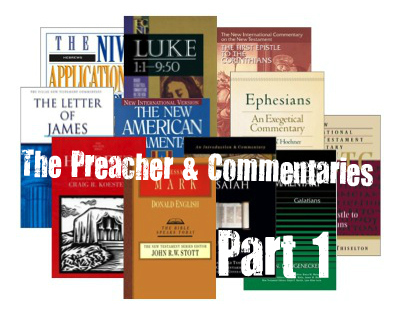 I’d like to offer a few thoughts on the use of commentaries. There are some extreme views around in Christian circles. For instance, some seem to suggest that commentaries should be avoided at all costs, as if they have a sinister agenda. Others will quote an interpretation and treat it as sacrosanct because it was in a commentary. Two views, both with their unique issues, both making the same error. The first view seems strangely oblivious to the unique privilege we have in our time of the accessibility of some very high quality resources, both in print and online. They may prepare on an up to date computer and drive to church in a modern car, but be positively pre-modern in their non-use of scholarship. The second view seems to be caught in the glare of flashbulbs as the wonder of publication seems to blind their discernment faculties. Just because something is in print, doesn’t make it right. We all know that with certain newspapers, but some lose that awareness when the book has a hard cover on it. Both views are making the same mistake though – they both lump all commentaries together. But, not all commentaries are created equal. Some are devotional, others are technical; some are written for the preacher, others for the scholar; some take interpretation seriously, others seem to use the Scripture as a launch point for doctrinal or precious thoughts; some believe God inspired the Bible, others don’t; some are written by Reformed, others by Arminian, others by Dispensational, others by Roman Catholics, others by … you get the point. Some don’t lump them all together. More than once I’ve come across people who will quote Matthew Henry’s commentary as if it were second only to the Bible, yet express deep distrust of contemporary evangelical commentators. Perhaps this is the power of the familiar, and therefore, perceived to be trustworthy? So let’s be careful not to subconsciously treat all commentaries as equal – either by dismissing all, or automatically trusting all. Even in a specific series, there will be stronger and weaker commentaries. So when buying paper commentaries it makes most sense to pick and mix to get the best from different series (although with software options, it may make sense to buy complete series due to cost). There are so many commentaries, but whatever we do, let’s not just lump them all together. Some are worth their weight in gold, some quite simply aren’t. Tomorrow I will offer a safety warning for commentaries.